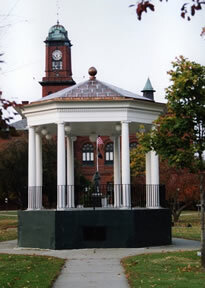 After a severe windstorm virtually destroyed the Claremont Gazebo/Bandstand, Ironwood Restoration was contracted to replicate the original 1920s structure. Because of the severity of the damage, the only original components that could be used were the capitals. All of the remaining components were replicated to exacting detail. The one compromise that was made during the rebuild was to add a slight extension to the overhang to help prevent future water damage. To help maintain the stability of the structure, an internal anchoring system was developed and installed. Upon inspection of the original framework and after a conversation with a local band leader, it was discovered that the original bandstand had been constructed with an inverted ceiling. This particular archictectural detail was also built in to the restored structure. An internal anchoring system was designed to prevent future damage from severe windstorms. The bandstand also includes a unique inverted ceiling for acoustical enhancement.